There are many banquet halls in Dallas, but there are only a few that can accommodate all your needs the way Y.O. Steakhouse can. Leave a lasting impression on all your friends and guests by renting out the beautiful Y.O. Steakhouse venue. Your banquet could have everything from a breath-taking venue, top of the line food, and everything you could ever need for it. They also have full bar service; electronics that will allow you to setup plasma TV’s in multiple rooms and put music on through the speakers going throughout the venue. Located in the heart of Downtown in the Historic West End District, the venue is beautifully decorated in a rustic elegant décor. It’s great for any sort of event, small or large. Our specialists have been putting together events for years and years, and will be able to speak with you to have everything in place exactly how you prefer. They have done large formal events, casual intimate gatherings, and elaborate parties that are detail oriented. So whatever you want your banquet hall in Dallas to be, we are here to serve you in any way possible. The overarching aspect that is going to amaze all your guests is the Y.O. Steakhouse’s food. Home of the legendary Buffalo Filet Mignon, featured on the Food Network as “one of the nation’s best steaks,” the Y.O. Steakhouse is recognized as one of Dallas’ top dining locations. Customers also rave about the desserts here with their delicious selection of chocolate cake, lemon blueberry cheesecake, crème caramel custard, and many other delicious choices. Y.O Steakhouse is one of the best at serving all your banquet halls Dallas needs, be it Downtown Dallas, Uptown Dallas, and the even the greater Dallas-Fort Worth area. Y.O. 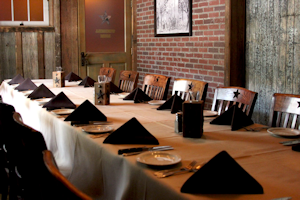 Steakhouse’s Dallas banquet hall is conveniently located one block from the Dallas West End Dart Station. What can banquet halls be used for? Our banquet halls in Dallas at the Y.O. Steakhouse can be used as a place where people go to celebrate an event, such as a wedding, bar mitzvah, retirement, birthday, sweet sixteen, and many others. How do you plan for a banquet hall event? The first step is finding a location that will accommodate everyone appropriately. Choose a location in an area where most of the guests are familiar with. If it’s not a place they are familiar with choose a place with easy directions to get there; for example, a place right off the ramp of the freeway. While looking for a banquet hall in Dallas you need to know how many guests will be attending before you choose the venue. That way you can choose a venue large enough that allows your guests to have room around them. There is nothing worse then going to a banquet hall and it’s overcrowded to the point people are cramped. When choosing your venue, you need to make sure there is plenty of room for the guests as well as the catering service, especially if there is going to be table service. Although the servers are used to squeezing by and holding their trays over their heads when they have to, that just opens up the opportunity for more accidents that could potentially ruin one or more of your guests evening. So why not let Y.O. Steakhouse put together your next banquet? You’re sure to have a fantastic party and great time. Amazing and unique environment – Excellent Service – Delicious food.